The spookiest day of the year is fast approaching, and if you're planning on doing the Monster Mash at a Halloween party, you're going to need some drinkspiration if you want to make it a real 'graveyard smash'. If you're serving up a spooky, cauldron-esque punch, you can take it to the next level by having ghostly hands and a haunted face floating in it, both keeping it cool and terrifying your guests. This wonderful old video on the Martha Stewart website tells you how to do it perfectly (you just freeze some water inside plastic gloves and a plastic mask). It's so easy but really effective. Not all ghosts are scary: some are just plain adorable. 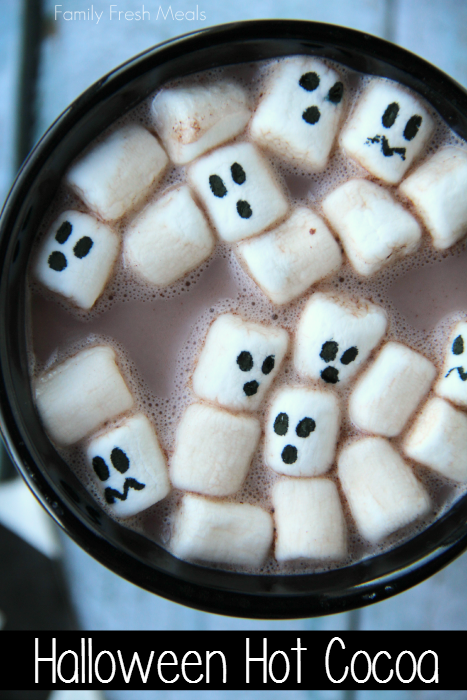 Don't let your Halloween cocoa be without these adorable little ghost marshmallows. All you need is some edible black marker, which you can buy for just £1.99 from The Craft Company. There are many variations of this online but this is by far the cutest. We have Family Fresh Meals to thank for that. Nothin finishes off a spooky cocktail (or even just your regular tipple) like a ghoulish glass, and there are plenty of them about, some of which are far better than others. I recommend Amazon's skull goblet (£11.23) or Hobbycraft's skull glass (£2) for some spooky sophistication. 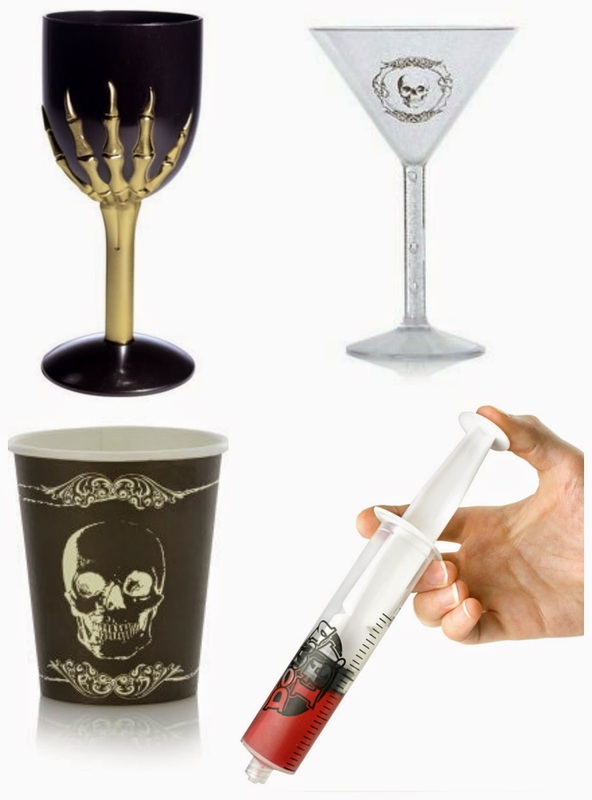 DrinkStuff also sell Halloween syringe shots (bottom right) you can fill with your favourite red cocktail (or fill with a grenadine-spiked shot): a set of 5 is £4.99. If you're not convinced about spending that kind of money on something you may well only use once, these skull paper cups (bottom left) are £2.95 and are still pretty stylish. This really is one of the best ideas I've found. It's practical as well as decorative, and ridiculously easy to make. You just scoop out all the innards, line it with ice cube bags or the like, and fill with ice and your bottles of choice. 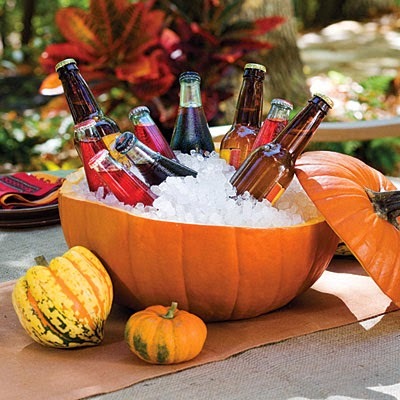 You've got Southern Living to thank for this idea: there's a video tutorial on their site, too. 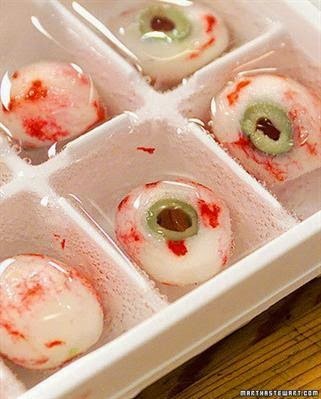 There are loads of Halloween ice cubes out there - from filling the tray with plastic spiders or gummy worms to dyeing the ice cubes red with blood orange juice. We hope your Halloween is spooktacular.